Welcome to edition 451 of Insider Weekends. 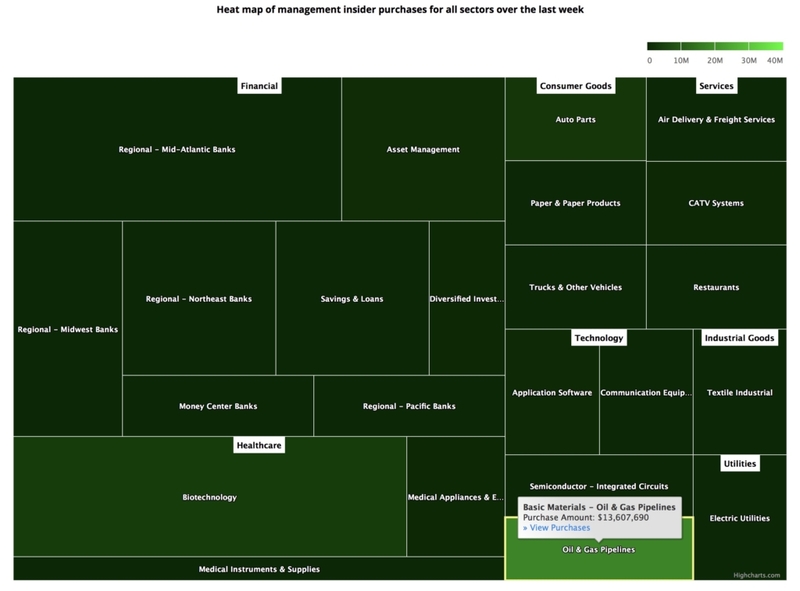 Insider buying more than doubled again last week with insiders purchasing $79.47 million of stock compared to $37.61 million in the week prior. Selling also increased with insiders selling $1.51 billion of stock last week compared to $831.23 million in the week prior. Sell/Buy Ratio: The insider Sell/Buy ratio is calculated by dividing the total insider sales in a given week by total insider purchases that week. The adjusted ratio for last week dropped to 19.02. In other words, insiders sold more than 19 times as much stock as they purchased. The Sell/Buy ratio this week compares favorably with the prior week, when the ratio stood at 22.1. Executive Chairman Richard D. Kinder acquired 750,000 shares of this oil & gas pipelines company, paying $18.14 per share for a total amount of $13.61 million. Mr. Kinder increased his stake by 0.32% to 236,177,613 shares with this purchase. We reported on $3.87 million of purchases by Mr. Kinder in the week prior and he more than tripled his buying last week. With the stock rebounding strongly off the Christmas Eve lows and trading close to a 52 week high, it is interesting to see Mr. Kinder continue to purchase shares. Kinder Morgan was one of the first companies in the energy industry to favor the Master Limited Partnership (MLP) structure that allowed companies to pay no corporate taxes and pass all its profits to investors as distributions. More than four years ago, it was also one of the first to abandon the structure by merging its four pipeline companies into a single one and adopting a traditional C corporate structure. With changes in the tax structure in 2018 pushing the corporate tax rate well below the top individual tax rate, the MLP structure was no longer as tax efficient as it once was and we have seen a number of MLP companies converting to C corporations in 2018. Director William P. Stiritz acquired 134,059 shares of this packaged foods company, paying $96.71 per share for a total amount of $12.96 million. Post Holdings was spun out of Ralcorp Holdings in February 2012 and has managed to buck the downward trend that most consumer packaged goods (CPG) companies like Kellogg have experienced over the last five years. 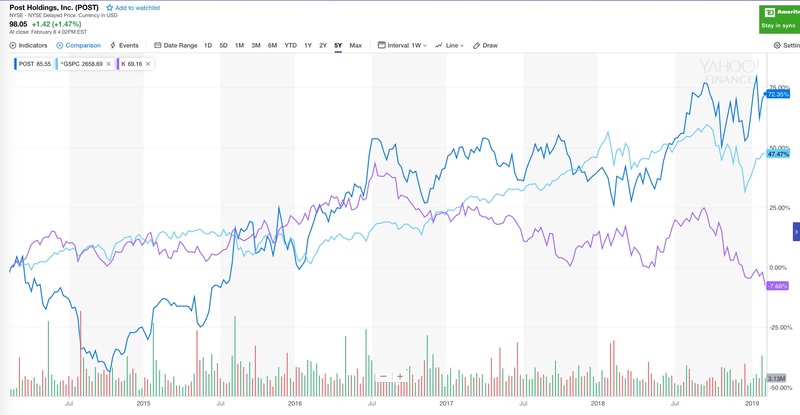 As you can see from the chart below, Post has not only outperformed the S&P 500, it has significantly outperformed other CPG companies. Some of Post’s growth was driven by a private label business and some through strategic acquisitions. The company now has a vast array of products and brands ranging from cereals like Honey Bunch of Oats to protein drinks offered through its Premier Nutrition division. Mr. Stiritz served as the Chairman and CEO of Post from its spinoff from Ralcorp in 2012 through 2014 and has since served as its Executive Chairman. You can view the list of recent insider transactions for Post Holdings, Inc. here. Director Donald E. Felsinger acquired 60,000 shares of this farm products company, paying $41.80 per share for a total amount of $2.51 million. These shares were purchased indirectly by a trust. You can view the list of recent insider transactions for Archer-Daniels-Midland Company here. Director Kenneth G. Langone acquired 40,000 shares, paying $21.26 per share for a total amount of $850,400. Mr. Langone increased his stake by 3.54% to 1,170,000 shares with this purchase. Director Robert J. Bishop acquired 35,543 shares, paying $21.51 per share for a total amount of $764,380. These shares were purchased indirectly by Impala Asset Management LLC. Director Paul R. Charron acquired 5,000 shares, paying $20.97 per share for a total amount of $104,850. Mr. Charron increased his stake by 15.90% to 36,449 shares with this purchase. Executive Vice President Richard Gerstein acquired 5,000 shares, paying $20.85 per share for a total amount of $104,250. Mr. Gerstein increased his stake by 23.60% to 26,186 shares with this purchase. You can view the list of recent insider transactions for Unifi, Inc. here. Director Betsy J. Bernard acquired 4,250 shares, paying $117.41 per share for a total amount of $498,994. Director Christopher B. Begley acquired 2,540 shares, paying $117.19 per share for a total amount of $297,659. President and CEO Bryan C. Hanson acquired 2,100 shares, paying $119.02 per share for a total amount of $249,936. Mr. Hanson increased his stake by 6.97% to 32,215 shares with this purchase. Director Gail Boudreaux acquired 2,095 shares, paying $119.33 per share for a total amount of $249,988. Director Robert Hagemann acquired 2,000 shares, paying $119.83 per share for a total amount of $239,651. Director Maria Teresa Hilado acquired 1,650 shares, paying $118.18 per share for a total amount of $194,990. You can view the list of recent insider transactions for Zimmer Biomet Holdings, Inc. here. Chairman, President & CEO Richard K. Templeton sold 90,842 shares for $101.14, generating $9.19 million from the sale. Sr. Vice President Gregory R. Delagi sold 33,371 shares for $101.02, generating $3.37 million from the sale. Sr. Vice President Haviv Ilan sold 23,174 shares for $101.02, generating $2.34 million from the sale. Sr. Vice President Niels Anderskouv sold 23,174 shares for $101.02, generating $2.34 million from the sale. Sr. Vice President Julie Van Haren sold 15,798 shares for $101.02, generating $1.59 million from the sale. 3,747 of these shares were sold as a result of exercising options immediately prior to the sale. Sr. Vice President Kyle M. Flessner sold 9,270 shares for $101.02, generating $936,455 from the sale. Director Pamela H. Patsley sold 7,000 shares for $106.20, generating $743,400 from the sale. These shares were sold as a result of exercising options immediately prior to the sale. SVP, Secretary & General Counsel Cynthia Hoff Trochu sold 6,953 shares for $101.02, generating $702,392 from the sale. Sr. Vice President Darla H. Whitaker sold 5,960 shares for $100.95, generating $601,658 from the sale. Sr. Vice President Ellen Barker sold 1,435 shares for $101.19, generating $145,203 from the sale. You can view the list of recent insider transactions for Texas Instruments Incorporated here. Director Mark D. McLaughlin sold 40,000 shares for $216.37, generating $8.65 million from the sale. These shares were sold as a result of exercising options immediately prior to the sale. EVP, Chief Technology Officer Nir Zuk sold 30,000 shares for $217.66, generating $6.53 million from the sale. CEO & President Jeffrey M. Leiden sold 32,250 shares for $186.35, generating $6 million from the sale. EVP, Chief Commercial Officer Stuart A. Arbuckle sold 18,309 shares for $186.20, generating $3.41 million from the sale. 7,959 of these shares were sold as a result of exercising options immediately prior to the sale. EVP, CRO Amit Sachdev sold 12,722 shares for $186.86, generating $2.38 million from the sale. 4,097 of these shares were sold as a result of exercising options immediately prior to the sale. EVP, CL&AO Michael Parini sold 5,780 shares for $190.22, generating $1.09 million from the sale. 2,330 of these shares were sold as a result of exercising options immediately prior to the sale. SVP & Interim CFO Paul M. Silva sold 5,536 shares for $188.41, generating $1.04 million from the sale. 809 of these shares were sold as a result of exercising options immediately prior to the sale. EVP, Global Research and CSO David Altshuler sold 4,126 shares for $189.19, generating $780,598 from the sale. You can view the list of recent insider transactions for Vertex Pharmaceuticals Incorporated here. CEO, President and Chairman Langley Steinert sold 293,515 shares for $41.71, generating $12.24 million from the sale. 29,350 of these shares were purchased indirectly through a trust. Chief Technology Officer Oliver Ian Chrzan sold 20,000 shares for $41.44, generating $828,800 from the sale. Chief Strategy Officer Manoj Apte sold 191,088 shares for $48.14, generating $9.19 million from the sale. These shares were sold indirectly through a trust. Chief Legal Officer Robert Schlossman sold 45,000 shares for $48.01, generating $2.16 million from the sale. These shares were sold as a result of exercising options immediately prior to the sale. You can view the list of recent insider transactions for Zscaler, Inc. here.